As with everything on your site, it is very important to track how your Accelerated mobile pages are used, especially for something as new as AMP. The specification allows for using multiple analytics services providers, but currently only Google Analytics, Google Tag Manager and Facebook Pixelsupport is automatically handled by weeblrAMP. Adding other analytics providers is perfectly possible either using a filter or template overrides. To get started, you only need to enable Google Analytics/tag manager or Facebook Pixel, and provide a valid corresponding id for each analytics tool you plan on using. Google Tag manager and Facebook Pixel are only supported in the regular edition of weeblrAMP. Tick the checkboxes in front of the analytics provider(s) you want to use. Amp now allows multiple providers to be used simultaneously. If using Google Tag Manager, the only configuration to do is enter your GTM ID in the Web Property ID field. Any further configuration is made in GTM itself. Note that you must create and use an AMP-specific GTM container: you cannot simply re-use your current GTM id for AMP Pages. Please see below for more details. If using Facebook Pixel, you also only need your pixel id from Facebook. weeblrAMP implements the Client ID API, which makes sure AMP pages are tracked properly when displayed on Google Cache and on your site. Consult with the provider of your Analytics plugin, or theme developer to find out how to modify your site Analytics snippet. Please refer to the specific paragraph at the bottom of this page. Checking this box will prevent any analytics data to be recorded until the user has clicked on a User notification display that you must create and enable (it's really simple!). 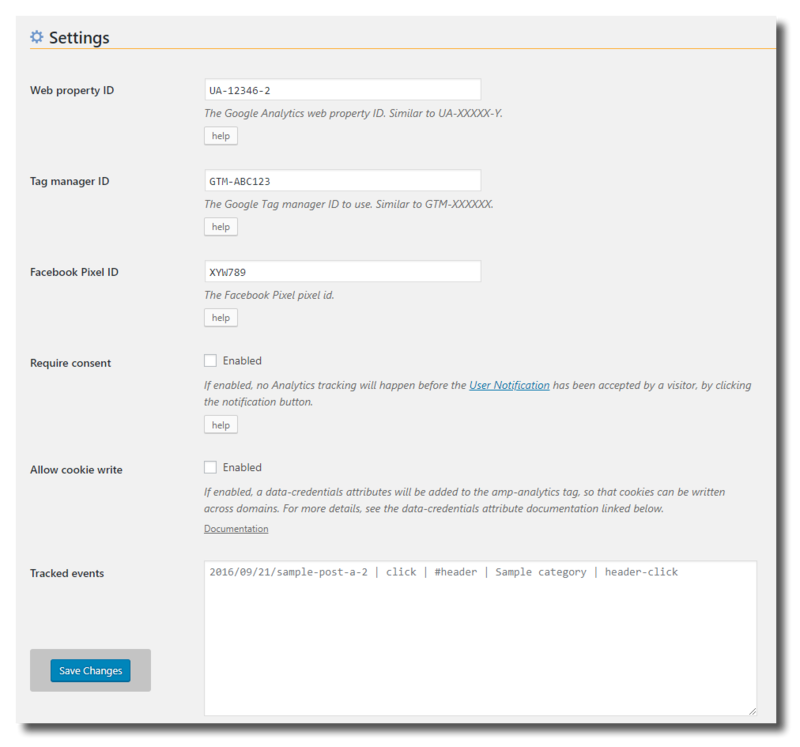 Checking this box will add the data-credentials="include" attribute to the amp-analytics tag. Please refer to the amp-analytics tag documentation for more details. weeblrAMP lets you take advantage of the advanced event tracking features of amp-analytics. 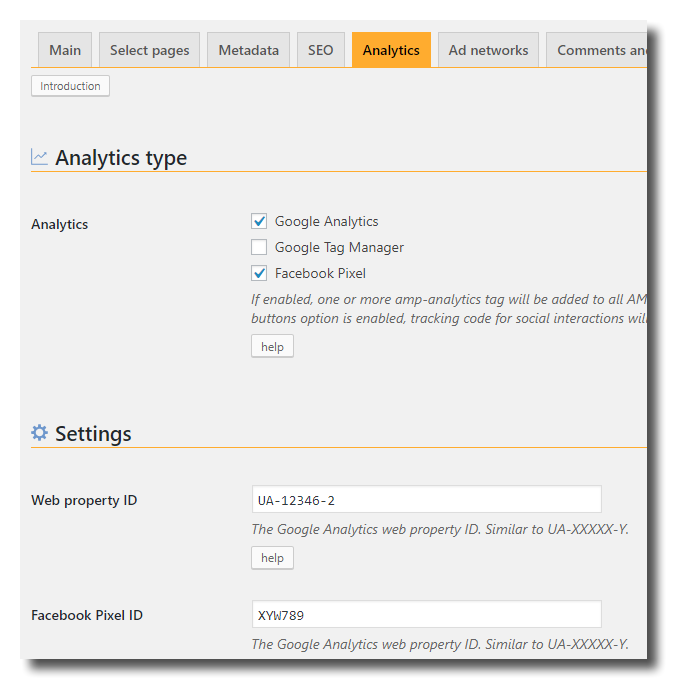 They are described on this page of Google Analytics documentation, and the amp-analytics components reference documentation can be found here. Event tracking is a rather advanced topic, but can provide great information about the behavior of your visitors. For instance you can learn about which and when buttons are clicked, or whether visitors scroll down to see your content. This section only apply to using Google Analytics or Facebook Pixel. If you use Google Tag manager, all event tracking is done inside Google Tag Manager itself, as usual. As we use the | character to separate each parameter on a line, please be sure to not use any | in them, particularly in your descriptive labels. The first line will cause clicks on the HTML element with an id of #header to be tracked by analytics, under the Sample category category and be identified as a header-click action. The second line will do the same for a different element and category, but will add a label of Summer sales and increment the counter associated with this event by 42. As both lines start with *, these event tracking instructions will run on all pages of the site. Again, be sure to actually check the specific Google Analytics documentation page for details about those settings. verticalBoundaries: a list of vertical scroll positions at which you want the event to be fired. Each position is considered a percentage, and should be an integer number between 0 and 100. Use  if you do not want to track this scroll direction. horizontalBoundaries: a list of horizontal positions to fire the event, with the same syntax. Use  if you do not want to track this scroll direction. The first line will cause vertical scrolling to 50% to fire an event. The second line will cause the same at 50% and 90% vertical position, plus another event fired if the page is scrolled horizontally to 90%. You can find details about the scroll event on the amp-analytics page. In all examples above, we have seen each event tracking specification started with *. This is the page selection rule, which decides on which page of the site the given event tracking will happen or not. This page selection rule lets you fairly easily specify individual pages or groups of pages. The rules you enter are based on the URL of the page. Use only the part of URL after the domain name: /growers is OK, https://www.mysite.com/growers is NOT OK.
Use the ? symbol to indicate any single character: /growers/2?-happy-orange-orchard matches any URL with any letter in lieu of the ? All other setup is done through Google Tag manager itself. 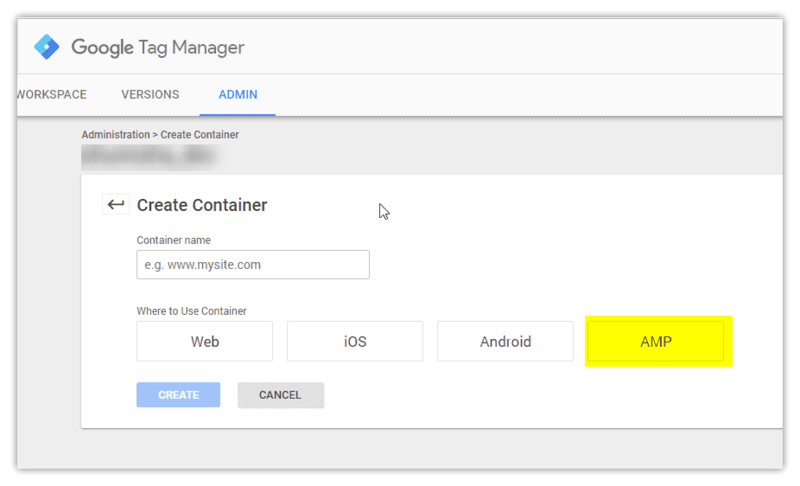 As mentioned earlier though, you must use an AMP-specific Google Tag Manager container. You cannot simply re-use your existing GTM container ID, as standard GTM containers are not AMP-compatible. As already mentioned, wbAMP implements the Client ID API. 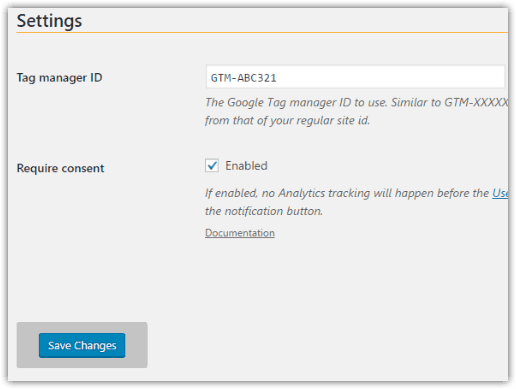 When using Google Tag Manager, you also need to enable this feature in GTM itself. Important: these steps must be taken on your standard tag container, not on the AMP container. Please refer to the linked Google documentation for up to date information on how to do this.